Ah, yes, the one with the eighties “lock and load” montage. By 1988, Freddy Krueger (Robert Englund) had gained such popularity, even in the mainstream, that one could find his burnt-up, misshapen mug plastered everywhere. The ghoul had his own TV show, series of novels, and even rap video with the Fat Boys. A true product of the eighties, A Nightmare on Elm Street 4: The Dream Master captures these excesses both in plot and execution, with Freddy expanding his influence beyond his killers’ offspring and New Line Cinema dumping more money into the production than in all the previous films combined. The result turns out as jarring as you might expect. Consider how Freddy is brought back this time around. The previous instalment put his spirit to rest by way of a consecrated burial, so I understand A Nightmare on Elm Street 4: The Dream Master starting off by desecrating his makeshift grave. However, director Renny Harlin, not exactly known for his subtlety, proves so eager to fill the screen with special effects that he abandons any sense of foreboding, coherence, or, frankly, good taste. I mean, come on, a possessed dog travelling to the dreamscape to pee fire in a valley of barking cars?! The same criticism applies to the kill scenes, which constitute my least favourite part of A Nightmare on Elm Street 4: The Dream Master. Gone are the eerie cat-and-mouse chases wherein plucky teens fight for survival in a surrealist landscape, replaced by wacky set pieces in which Freddy dominates his prey from beginning to end. To make matters worse, screenwriters Brian Helgeland and Scott Pierce treat these deaths like sketch comedy, throwing in oddball jokes like a Jaws (1975) spoof, an invisible karate fight, and a downright shameful amount of puns. In fairness, Robert Englund (who gets top billing for the first time) remains menacing even as he’s cracking wise, and Harlin keeps us on edge with truly grotesque imagery. Take, for instance, the spectacularly disgusting scene in which a teenage girl transforms into a cockroach or, better yet, the shot of Freddy’s victims sprouting from his torso like little sentient warts begging to be popped. 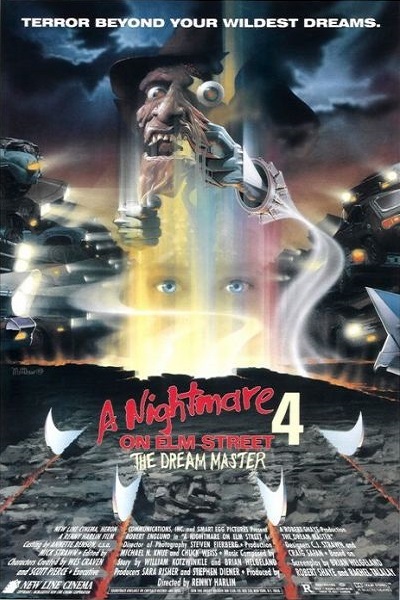 Some of these sights still haunt me to this day, yet A Nightmare on Elm Street 4: The Dream Master comes across less like a horror flick than a lurid comic book fantasy designed for serialisation. Like every episode of the Freddy’s Nightmares TV series, A Nightmare on Elm Street 4: The Dream Master has really got two stories. In the first, Freddy returns to dispatch the remaining Westin Hills patients from A Nightmare on Elm Street 3: Dream Warriors (1987). Then, at the halfway mark, Kristen (Tuesday Knight) transfers her “dream conferencing” powers to Alice (Lisa Wilcox), who connects the baddie to a whole new set of cannon fodder teens, each with a single defining trait she can later absorb as the true dream master: Sheila’s (Toy Newkirk) aptitude for science, Rick’s (Andras Jones) martial arts skills, Debbie’s (Brooke Theiss), uh, knowledge of best practices when weight training… How did these kids end up friends again? Perhaps I should’ve put a spoiler warning before revealing the second plot. Then again, no one watching A Nightmare on Elm Street 4: The Dream Master could mistake Tuesday Knight for a leading lady. I suspect Kristen was intended to be the titular dream master, prompting some synergy-obsessed producer to replace Patricia Arquette with an up-and-coming pop star whose latest single can be shoehorned into the credits. It must have been an iron clad contract for New Line Cinema to sneak in a new protagonist by way of plot contortion instead of just recasting the part with Lisa Wilcox from the get-go. Mind you, Wilcox, who’ll carry A Nightmare on Elm Street: The Dream Child (1989) just a year later, takes some time to settle into her own role, overdoing the whole wallflower routine in the first act. To be fair, her performance does improve as the character gains confidence, emphasising her transition from mousy star-gazer to decisive super-heroine. By the time A Nightmare on Elm Street 4: The Dream Master reaches its admittedly goofy climax, Alice not only trades gravity-defying punches with Freddy but also turns the tables on eighties gender conventions by coming to the rescue of her “jock in distress” suitor (Danny Hassel). At any rate, I like that our heroine only becomes a full-rounded person once she’s internalised her friends’ best attributes, a conceit that parallels our villain fueling his demonic existence with the souls of his victims. There exists, after all, a fine line between using your loved ones’ support to build your own identity and feeding off everyone around you like a sick parasite. A Nightmare on Elm Street 4: The Dream Master further illustrates this notion by having Alice gradually remove photos from a mirror to uncover her own reflection. The motif pays off in fantastically gruesome fashion when Freddy himself peers into the looking glass. You see, despite its commercial cynicism, A Nightmare on Elm Street 4: The Dream Master still finds new ways to convey the series’ central theme of empowerment through personal awareness. Just as A Nightmare on Elm Street (1984) used the dream world as a metaphor for denial and A Nightmare on Elm Street 2: Freddy’s Revenge cast our baddie as an embodiment of sexual repression, this latest chapter invites us to confront our true selves and discover whether we’ll find strength or deficiency in the way we relate to others. Just don’t ask me where the “lock and load” montage fits in all this.